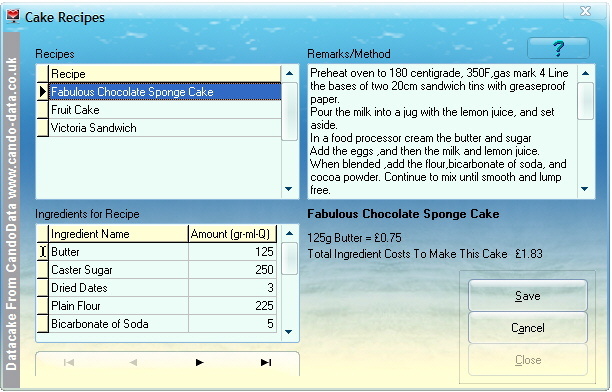 The recipe screen enables you to enter and edit the quantity of ingredients used in the making of any of your eight inch square or nine inch round cake recipes. From the values entered in this form the precise quantity of each ingredient used in all other cake sizes from five to sixteen inches is calculated. The price of each cake is based on figures entered by you in the inch rate or hour rate section of the set-up screen and the ingredient prices taken from the ingredient cost and weight screen. The recipe sheet button at the bottom of the Options form (press the Recipes ingredient and order option button on the switchboard) will open printable tables showing the precise quantity of every ingredient required for each of your recipes cake size from five inch to sixteen inches.